As did our patriots for independence in front of the Spanish army in the nineteenth century, youths from the east of the island have begun to burn the constitution of the Republic of Cuba in public places. Some, like Néstor and Rolando Rodríguez Lobaina, Yordi García Fournier and Jorge Corrales Ceballos did so in early January in the central park of Baracoa. When they were interrogated by the Creole Gestapo they replied that if a document as important as the constitution of a country only serves to protect victimizers and not victims, if it is the shield and refuge for imprisoning citizens without the opportunity of a defense, if it provides cover for the government to decide who enters or leaves the country, when and how it pleases, then it serves no purpose, and must be destroyed, at least physically. It had already been done in Banes and Palma Soriano, and the flaming torch will continue to appear as one of the methods used here to demonstrate civil resistance and civil disobedience. Symbolically burning or burying the Constitution of Cuba, destroying it in front of government institutions, is becoming common for public officials, who impassively observe the action. The moorings are loosening, little by little. Nearly two hours locked in a terminal, then fifteen dollars for illegal Cubataxi service that left me stranded in El Majá, near Taguasco, a kind of labyrinth without exit where I found an escape to the national highway. Some strangers, polite casual friends, encouraged me in the middle of the nocturnal depression, to get on a container truck that finally took me to Havana, a city I travel to about twice a year when my meager economy permits me. I imagined the torment of the Mexicans escaping to the U.S., because we almost froze that morning of January 14 with its 44 degrees Fahrenheit pushing us to the city. Every day I understand more the helplessness with which the government has driven us Cubans. The extra bus trips of the ASTROS company are now stuffed with the mass transportation of soldiers, students and construction brigades. A herd of predators cover the provincial terminals and with the complicity of the transport managers, completely exposed, rob the travelers. I couldn’t be in a workshop on communications and audiovisuals that the Culture sector would give in Holguin, due to the fears of someone, the evil gossip of the same ones who never allow me in the state temples. But in Havana, Father Joseph Conrado was waiting with open arms in Yoani Sanchez’s house to talk to us, a group of Cubans, about the love of the Virgin of the Charity of Cobre, about her undeniable presence on the edges of the island. The love of the Virgin of Charity and her infinite goodness is something that can unite us forever, Father J. Conrado said, and I know that it wasn’t an odyssey of over 400 miles in vain. This was a trip from hell to a sanctuary where I feel I am among friends. My year starts at full speed. In Holguin the provincial committee of the National Union of Writers and Artists of Cuba, also known by its initials UNEAC, decided in December to fire two writers from their jobs, an act followed by the expulsion of one of them from its membership. I heard about it some days later from intellectuals who participated in the “meeting and purge” and who gave me the details. García Verdecia, poet and novelist, was also vice president of UNEAC in Holguin and was accused of not acting in a manner consisted with this duties as director, and so having ceased to be reliable, according to the opinion of the current president of the Writer’s Union. Vilches Proenza was intercepted by the same computer security officials and they took his flash memories which contained personal data as well as messages exchanged with Cuban writers living in exile. In a letter sent to writers and friends that circulated in December by email on the “Cuban Intranet” the Holguin novelist Manuel García denied having violated the rules established by Resolution 127 of 2007 about computer security, dismissed the accusations of the UNEAC president painter Jorge Hidalgo Pimental, and said he’d swiped an intellectual opinion but in order to improve the social process embodied in the Cuban Revolution. For his part, the novelist and poet Rafael Vilches has decided to retreat to his house and make no public declarations. Four years ago, a group of young people in Holguin including myself, created the literary publication Bifronte, but we were threatened, interrogated, and some of us were expelled from our work in the cultural sector for heading up a cultural project the margin of Cuban officialdom. 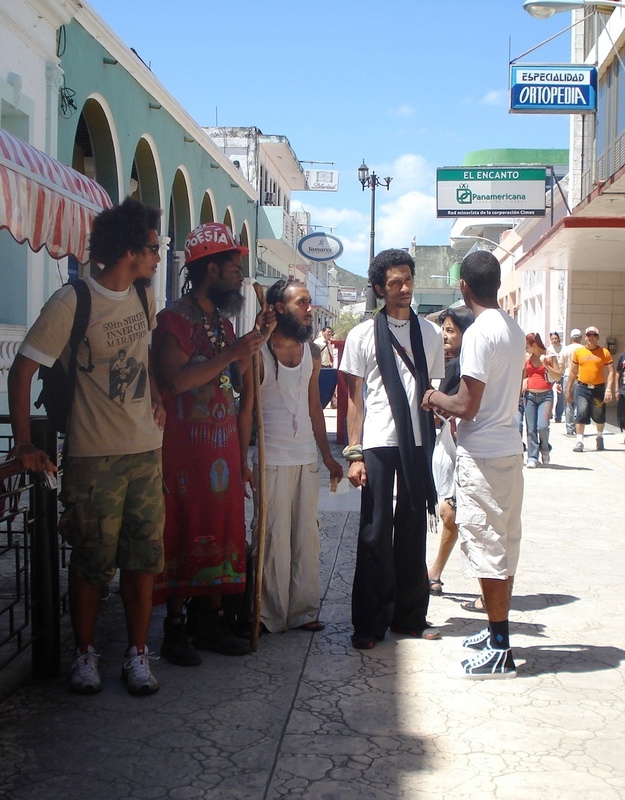 Friends from that era who walk the world knew, through messages coming out of Cuba by the same Internet route that no one can control, what happened and asked me to recall at least some of Rafael’s verses. I prefer these.